By the 1880’s, commercial photo studios had found their way into the bazaars of the Presidency’s medium sized towns across India. Husbands and wives, brothers and sisters, grandparents and grandchildren could now walk into a studio, take a pose, and look into the camera to be fixed and framed. These family portraits not only present a visual record of a family’s history, often showcasing multiple family generations; they also constitute a wealth of information on costume and Tamil social history. Dr. Zoe Headley and a team of French and indian researchers from the Social Science Department of the Institut Francais de Pondichery are working to preserve this historical legacy as a digital archive in their library for public benefit. The images are part of an ongoing project tracing the social history of Tamil studio photography and investigating the visual rhetoric of family portraiture in South India. The full archive will be available for public access at the completion of the project. 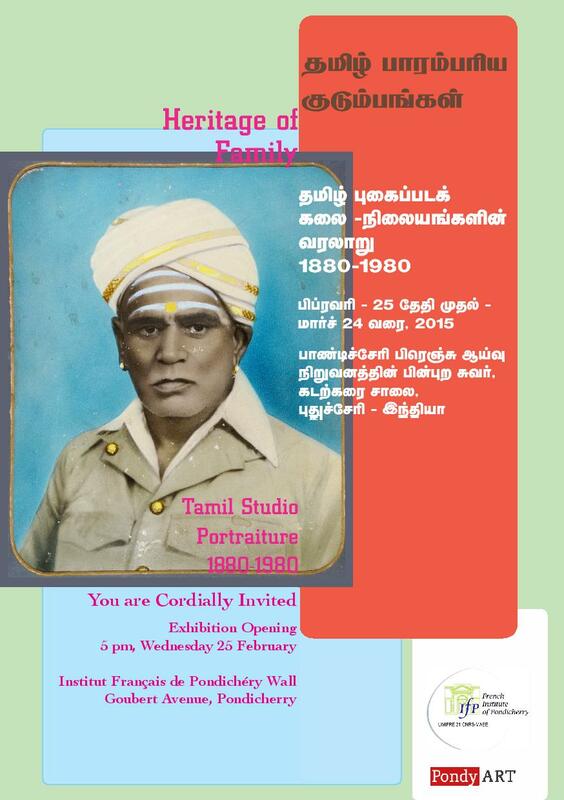 The IFP has joined forces with PondyART to give the public the opportunity to enjoy a sample of the photographs so far collected, observe the styles Tamil Nadu photography studios utilised for the printed images and reinforce the importance of preserving this visual record of local heritage. The exhibition will coincide with the Pondicherry Heritage Festival.